The Gunsite, Moor Lane, Lower Kinnerton, Cheshire, CH4 9AQ. 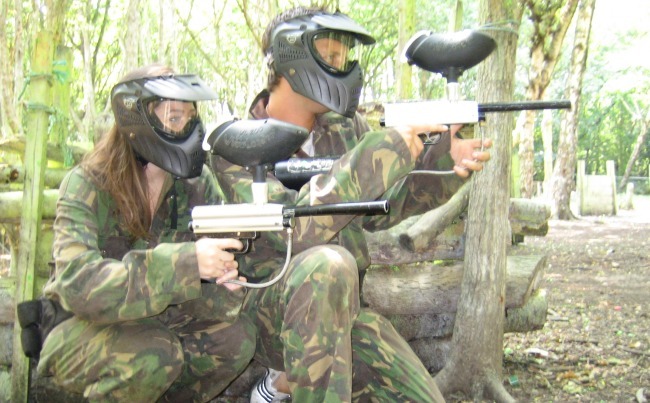 Situated in the beautiful Cheshire countryside, Paintball Cheshire provides a fantastic day out for all types of groups. Whether you are celebrating a birthday party, stag do, or just fancy a day out, this venue has excellent facilities to ensure that it is a day to remember. With over 10 different paintball fields, there is a huge variety on offer at Paintball Cheshire. We run games for all types of player, from first timers to seasoned veterans, and with over 50 different types of game to choose from, we are sure to find the perfect game for you. Equipped with your semi-automatic paintball marker, you and your team will take to the battlefield and hopefully bring home victory. The woodland provides a perfect setting for paintball, and our game zones have been professionally designed to offer a challenging landscape, with lots of places to hide, and plenty of good sightlines to spot your opponents. Are you up to the challenge? Address: The Gunsite, Moor Lane, Lower Kinnerton, Cheshire, CH4 9AQ. Sat Nav Coordinates: N 53° 8' 51" W 2° 59' 5"
This is a real taste of tournament paintball. The Cheshire paintball venue uses top-end inflatable barricades, the kind you’d find at the pro paintball tournaments, to give you an idea of what professional paintball is all about. Scary full on action and lightning fast play will get your pulse racing and adrenaline pumping. This paintball game zone is real test for any paintball player and will be a great warm-up to your paintball session at the Cheshire paintball venue. You will need to be an organised and tactically aware paintball team on this game zone as straight from the off you can be pinned down and therefore unable to mount a paintball attack. You must be brave and advance up the field as far as possible if you want to take control of the game, the team that does this is certain to win! The second paintball game zone at the Cheshire Indoor venue is Jail Break, which is a little more traditional for recreation paintball. This is a themed battle using a classic attack and defend scenario, in which great Cheshire paintball action is assured. Built up with massive tyres, giving players plenty of little places to hide and snipe at the enemy. This game zone, at Cheshire Indoor, features a tunnel and then the 8 foot square jail. Can you and your team-mates make to the jail in time to rescue your banged up comrade. This Cheshire paintball game is really aimed at putting a fun aspect on the game, but remember you will still need to keep your wits about you as points are available for attacking and defending the jail.